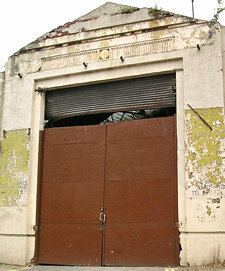 At the Executive meeting on Thursday members voted to proceed with the demolition of the former Airspeed factory building (Reynard’s garage). There will be a planning application submitted for this demolition. As the council owns it and the council also decides on planning applications then quite how that works democratically I don’t know. Basically the council gives permission to itself. And may perhaps get on with beginning to demolish it before official approval, as I was told had happened on ‘health and safety’ grounds with the RCAF hostel (aka the ‘hutments’/Marygate Centre) behind the art gallery. Another bit of 20th century history removed. Anyway, let’s try to find something positive. Briefly I felt invigorated and inspired, while watching and listening to the speakers at the meeting, via the webcast. Speaking in favour of keeping and repairing the old Airspeed factory were Alison Sinclair, Joshua Taylor, John Gallery and Dave Taylor, in the ‘Public participation’ bit, agenda item 4. You can watch it on YouTube. This link should start at the relevant point, or watch below, move the slider to 16 mins in. The public participation is always worth watching. Passionate and well-informed people making their case. On this occasion I knew in advance about three of them, as we’d been in touch by email before the meeting. I didn’t know about Joshua Taylor’s contribution but I liked what he said (at 20 mins 8 secs in the recording). I asked him if he could send me the text. Here it is, as a PDF, if you’d prefer to read it. There was something very heartening about hearing all these people speak up for a building many other people just view as an inconvenient eyesore. The fact that they could see it as something else in the future shows imagination and sensitivity to what heritage is and what it means. At the heritage event last weekend the point was made during discussions that heritage is about the future as well as the past – the choices we make now about what we want to preserve for people in the future to experience and appreciate. It’s not backward-looking, it’s future-enhancing. Or could have been. Not in this case. I was thinking a lot about the councillors and their responsibilities, particularly after having a brief chat with Chris Steward last weekend, at the heritage event. The event had been cheering as it brought together many different perspectives, and decision-makers with people who try to influence those decisions, the ‘heritage brigade’. I went away feeling like much more was possible, feeling cheered and heartened. I also went away from it realising that the Airspeed/Reynard’s building had so much support, having been mentioned many times by various speakers. And because of that, wanted to encourage the many people I know who read this site and care about the building to put their views across. As the building had so much support for so long from so many people from so many different backgrounds and perspectives I really thought the council would choose to save it, and undertake the necessary repairs. I’m sorry that they didn’t and I hope that those of you who responded to the earlier page don’t feel like you wasted your time. I feel like I wasted mine, on this and many other cases where buildings on the draft ‘Local List’ have been under threat and then demolished. As most of them have been cleared out of the way already there’s actually only one threatened bit of industrial heritage still standing that I really care about. I wonder if any of you can guess what it is. I doubt I’ll be trying to save it. Such efforts seem increasingly pointless really, don’t they, and I’ve got better things to do with my time, as I’m sure you have too. Let’s just let our elected representatives get on with it, like we did back in the old days.